Acne is an inflammatory skin disorder caused by an over-production of sebum. Each person's skin is unique and the reasons for outbreak vary widely. The exact cause of acne is not known, but some factors include stress, diet, monthly menstrual cycles and the use of cosmetics. Essential oils can play a significant role in skin and hair care. Acne treatment can be achieved naturally without using harsh chemicals. Their natural healing properties allow them to effectively assist in the treatment of skin problems; a great alternative to traditional acne medication. The therapeutic properties of the essential oils in this blend can dramatically reduce redness and swelling thus encouraging the disappearance of pimples. It can enable the acne to heal gently thereby leaving no scarring. To use apply directly to each acne spot using a cotton swab. Blend of: Geranium Bourbon, Pink Grapefruit, Cedarwood deodara, Peppermint, Rosemary, Roman Chamomile. 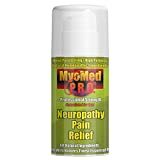 GET FAST NEUROPATHY RELIEF AND LIVE A PAIN FREE LIFE MyoMed P.R.O. Neuropathy Pain Relief Formula provides fast, safe and effective relief from your neuropathy pain with it's all natural, potent blend of homeopathic, powerful essential oils. These same essential oils have been used for centuries around the world to provide fast, safe and effective pain relief. NATURAL HOMEOPATHIC INGREDIENTS THAT GIVE YOU FAST PAIN RELIEF We never use synthetic chemicals, dyes, parabens, or fragrances in our products. When you purchase MyoMed P.R.O. Neuropathy Pain Relief formula today, you're getting a natural blend of potent, homeopathic, essential oil ingredients! You get the fast relief you need for your neuropathy symptoms without the chemicals that can clog your pores and irritate your skin. Plus we NEVER test our products on animals. You can feel good about using MyoMed P.R.O. products. PERFECT FOR NEUROPATHY PAIN You want fast, safe and effective relief... but don't want to take a lot of time out of your day to get it. With MyoMed P.R.O. Neuropathy Relief formula, getting relief is easy. Just apply the cream when your pain starts to appear. It goes to work FAST and lets you live life pain free. No mess, no fuss. A NAME YOU CAN TRUST AND A PRODUCT YOU WILL LOVE MyoMed P.R.O. products are made in the USA. Don't Take Our Word for It - Try MyoMed P.R.O. Neuropathy Relief Formula Yourself! We're confident that you'll love your relief that it provides for your painful neuropathy symptoms.